This week has been Busy with a capital B! Monday was very uplifting and reenergizing. We have had Allan Johnson at our school for the past week. If you don’t know who Mr. Johnson is you can check out his web site at www.johnsonperformancesytems.com. His PD is centered on teambuilding, brain based learning, music in curriculum, and common core thrown in for good measure. Music is instrumental in his presentation, his message and his teaching. Not only did we have the pleasure of having him for our PD day on Monday we (our students) had the pleasure of learning from him the week before. 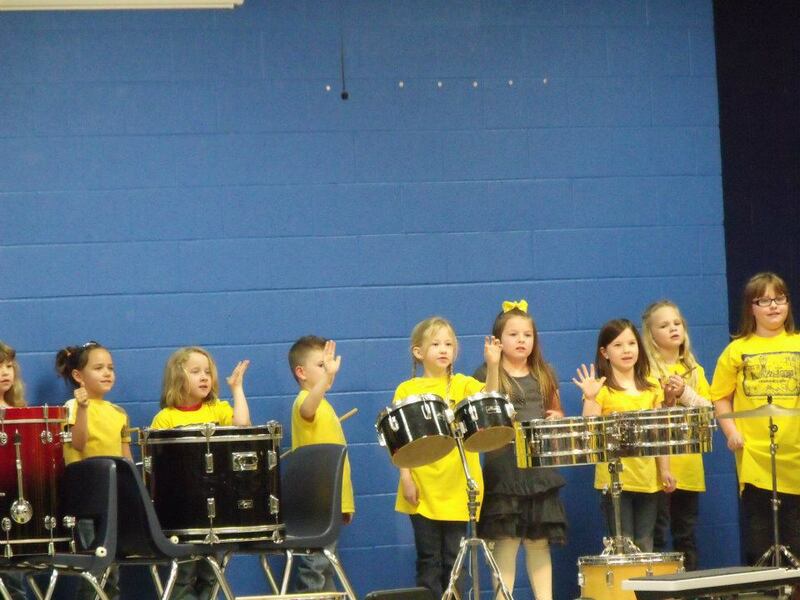 He taught ALL 240+ students how to play drums, use the drums and music for focus and self-discipline, engagement and learning essential skills. THEN Tuesday night he put on a concert with the kids for our entire school and community. It was A*M*A*Z*I*N*G!!! 240+ kids 4 to 12 years old, playing and performing for their families after just 5 days of learning/practice AND 15 teachers who were the GRAND Finale!!! We were the “big surprise” for the kids. We had practiced in secret to surprise them. They were amazed! 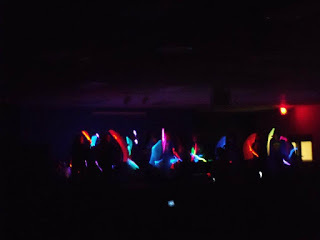 We came in with glow wands, head bands, and attitude. 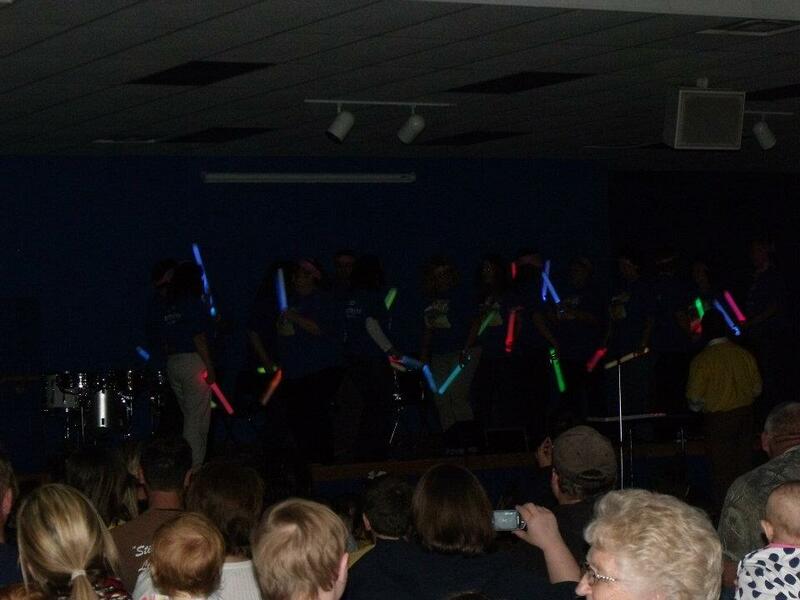 We then did a little hand jive with the glow wands, and the grand finale of a drum song of our own. 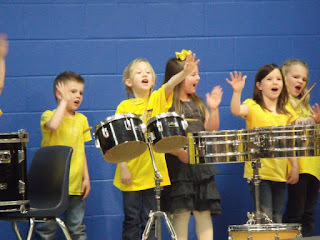 The crowd went WILD…ok the kids laughed and cheered. It was so much fun, and so needed this time of year to revamp, refocus, reflect, and reenergize. If you need some refueling in your school you should check him out! They are singing give me FIVE a little chant about the five parts of a complete sentence. Too cool! 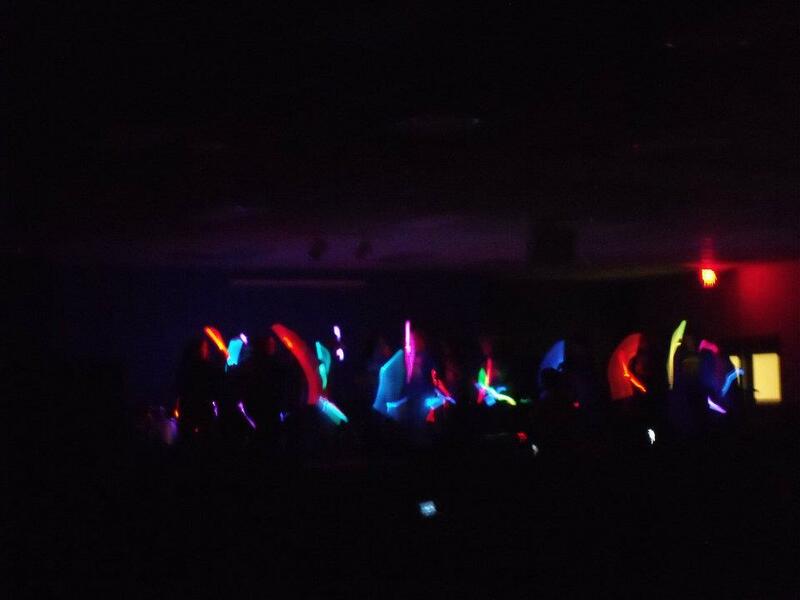 We have decided next year we want glow in the dark drum sticks!! I got a new kiddo Wednesday. He’s cutie with big blue eyes and he can READ which is always a great thing this time of year, and then yippee faculty meeting after school. Today was Groundhog Day check out one of my cuties in her Groundhog headband. We made these courtesy of FirstGrade Blue Skies. Tomorrow is our 100th day of school, and our school wide “read and feed.” Kids get to bring snacks, pillows and blankets and spend the biggest part of the day reading. YAY! Another great thing about my new kiddo… his dad works for Hostess! We get 100 donettes (sp?) for our 100th Day Celebration! Woo Hoo!! It’s been a CrAzY- busy week, but filled with great things. I hope the weekend is calmer! 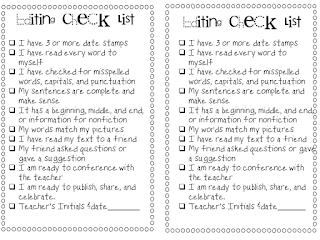 One week from today my bestest teaching buddy and I will be having supper with the ladies from Made for First Grade! I am SO excited and anxious! 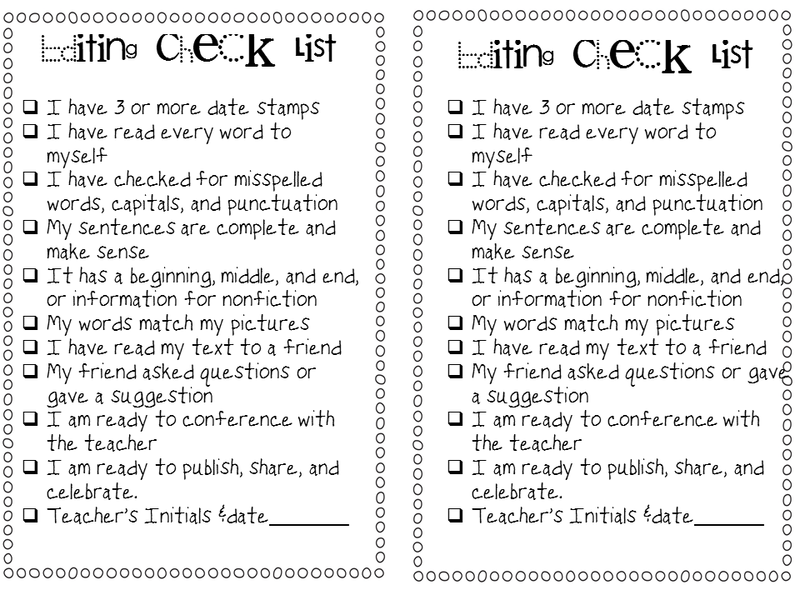 Coming soon a peek into my writing workshop… until then here is a copy of an editing list I made up for my kiddos. You can download it here. Hope you have a great Friday and lazy, relaxing weekend! Love the post Tammy!!!! Looks like an amazing team building program! 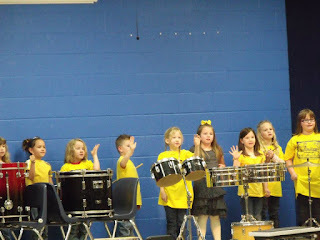 I love integrating music with learning. What a great opportunity you and the kids had this week. Very cool PD and you're very lucky!!! PS your new guy beats my new guy. WOW! What a fun week! I want to go to your school!